The Agricultural Model Intercomparison and Improvement Project (AgMIP) has been and continues to be an important forum for agricultural modelers to come together and compare their modeling efforts, with the objective to improve our understanding of the uncertainties facing agriculture, and to leverage modeling tools to better inform policymakers. IFPRI has been an integral collaborator in these efforts from the beginning both on the crop modelling side, through contributions to global gridded crop modeling by Ricky Robertson, as well as on the economic side, through contributions from the IMPACT team. 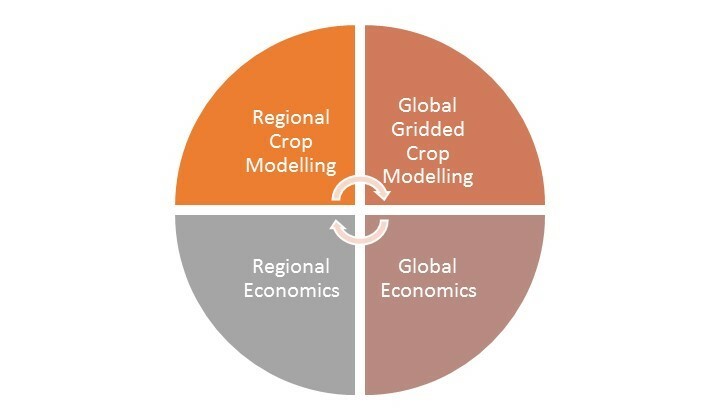 In the current phase of AgMIP (Phase II), IFPRI is playing a key role helping to link the various components of the Coordinated Global and Regional Assessments (CGRA, figure below) in efforts to simulate +1.5 and 2.0 °C futures for an upcoming IPCC special report and related journal articles. Daniel Mason-D’Croz has been the primary link between the Global Gridded Crop Modelling (GGCM) and the Global Economics, as well as between the Global Economics and Regional Economic analyses. In these efforts Daniel, has translated GGCM results for use by Global Economic modeling teams, and has downscaled Global Economic modelling results for Regional Economic analysis at the sub-national level in Senegal and Pakistan. In efforts to contribute to a future IPCC special report on Land-use Change, Daniel has designed, analyzed, and shared IMPACT scenario results of more fully quantified socioeconomic and mitigation scenarios. In support of work towards both IPCC special reports (1.5 °C and Land-use Change), Daniel and Keith Wiebe represented IFPRI in organizational meetings in Washington, DC in March 2017. These organizational meetings helped define the scenarios that would be used to simulate the 1.5 and 2.0 °C futures. Additionally, Daniel attended the CGRA +1.5 and 2°C Workshop in Vienna, Austria which took place in July 2017 (for more details on this workshop see AgMIP’s blogpost and Workshop report), where he presented IMPACT results from the most recent GGCM climate results. Daniel then participated in follow-up global economic meetings to discuss the involvement of other Global Economic modelling teams in the 1.5 and 2.0 °C efforts, as well as refining the scenarios that will contribute to efforts towards the Land-use Change report. AgMIP Phase II continues the practice of ambitious coordinated modelling, with high-level analysis seen in Phase I. In AgMIP Phase I, with contributions from IFPRI’s Jerry Nelson, Sherman Robinson, Ricky Robertson, and Daniel Mason-D’Croz, seven articles were published in 2014, with one article in the Proceedings of the National Academy of Sciences, and six articles in Agricultural Economics. These papers have quickly attracted significant attention and are among the most highly cited articles (top 1%) in their academic fields, according to the Web of Knowledge and Altmetric. The von Lampe et al. (2014) overview paper has received further recognition this year, being awarded a Citation of Excellence by Emerald Publishing in the areas of Business Management, Finance, Accounting, Economics, and Marketing. Between Phase I and Phase II, IFPRI co-led efforts by AgMIP’s Global Economic modeling team to build on the work of Phase I, expanding the range of climate and socioeconomics scenarios considered. This work led to a journal article published in 2015 in the journal Environmental Research Letters led by IFPRI’s Keith Wiebe. IFPRI also participated in a parallel multi-model scenario exercise led by the OECD that led to an OECD Report on Alternative Futures for Global Food and Agriculture. IFPRI’s contributions to AgMIP activities have been supported by funding from AgMIP, the CGIAR Research Program on Policies, Institutions, and Markets (PIM), the CGIAR Research Program on Climate Change, Agriculture and Food Security (CCAFS), the Bill and Melinda Gates Foundation, and the US Department of Agriculture.